The Stratford Shakespeare Festival’s Board of Governors is delighted to announce that Des McAnuff will continue as Artistic Director through the 2013 season. “Mr. McAnuff is a very gifted director and leader who is much in demand, and we are delighted that he has agreed to continue as our Artistic Director for an additional two years,” says Dr. Lee Myers, Chair of the Board of Governors. “Stratford is an extraordinary place,” says Mr. McAnuff. “The Festival is a treasured institution for our audiences, our artists and our country. We’ve been able to make some great strides in the last four years, both building on our longstanding traditions and infusing a renewed spirit of innovation. I’m thrilled to continue as Artistic Director through to the 2013 season. “Mr. McAnuff has made his mark on Stratford in his first four years at the helm as Artistic Director,” says Dr. Myers. “He has strengthened our exceptional acting company and added to our ensemble of internationally renowned directors and other theatre artists. He has successfully expanded the Festival’s work into other media, filming productions of Caesar and Cleopatra and The Tempest for cinema release and television broadcast. “At the same time, our work is finding a home further afield with the co-production of Phèdre in San Francisco, the transfer of A Funny Thing Happened on the Way to the Forum to Toronto, and the extended run of Brian Bedford’s hugely successful production of The Importance of Being Earnest in New York, for which Mr. Bedford received a Tony Award nomination. “Mr. McAnuff’s progressive stance on casting has increased the company’s diversity, a trend that has been lauded in the media and among members of the industry. Deeply committed to developing new audiences and increasing student attendance, he is also dedicated to providing the best training for Stratford’s artists through our Birmingham Conservatory for Classical Theatre and the Michael Langham Workshop for Classical Direction, thereby ensuring that future audiences will continue to enjoy superb classical theatre. “His strong commitment to new play development is evidenced by the numerous world premières staged over the last four years, including this year’s new version of The Little Years by John Mighton, which was commissioned by the Festival. A one-man show adapted, arranged and performed by Christopher Plummer is one of the highlights of the Stratford Shakespeare Festival’s 60th season, a season that also features three world premières – including a new Canadian musical. The playbill announced today by Mr. McAnuff includes three Shakespeare plays (plus a comic one-man adaptation of Macbeth), a tragedy by Sophocles, a Gilbert and Sullivan operetta and a selection of other musicals and comedies that will appeal to audiences of all ages. “I’m very excited about our 2012 season,” says Mr. McAnuff. 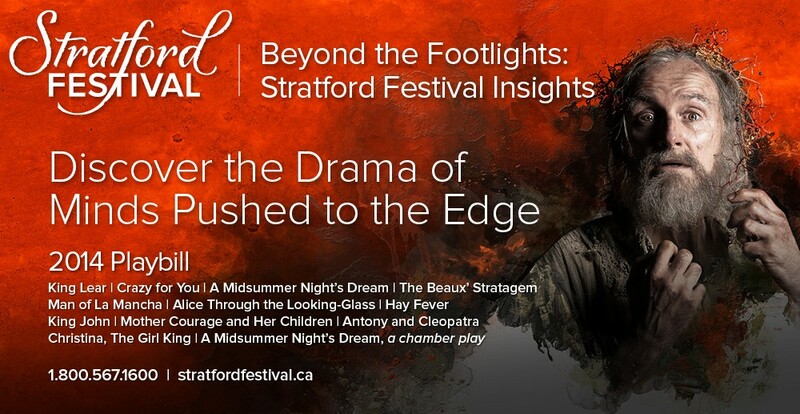 “It covers the complete Stratford landscape, from Shakespeare – and an innovative Canadian take on Shakespeare – to a substantial body of new work. “By including one of the classic Greek tragedies on our playbill, we touch the very roots of western drama; and to have the great Christopher Plummer return to our company in a show of his own creation seems to me to embody perfectly the marriage of tradition and innovation that characterizes our Festival. At the Festival Theatre, Mr. McAnuff will direct Henry V, perhaps Shakespeare’s most penetrating study of kingship. Ending years of civil strife occasioned by his father’s seizure of the crown, Henry unites his people by means of a campaign against the French, culminating in his famous against-the-odds victory at Agincourt. Also at the Festival Theatre will be one of Shakespeare’s most popular comedies, Much Ado About Nothing, directed by Christopher Newton, former Artistic Director of the Shaw Festival and a member of the Stratford Festival acting company in the 1960s. Featuring the famously bickering duo of Beatrice and Benedick, it’s a tale of young love disrupted by the villainous Don John, whose machinations are finally brought to light by the hilariously inept Dogberry. 42nd Street, with music by Harry Warren, lyrics by Al Dubin and book by Michael Stewart and Mark Bramble, follows the journey of Peggy Sawyer, a chorus girl who becomes a star when she takes over a leading Broadway role on opening night. Regarded by many as the quintessential backstage musical, it will be directed by Gary Griffin, whose Stratford productions of West Side Story, Evita and Camelot have won widespread popular and critical acclaim. Completing the line-up at the Festival Theatre is Thornton Wilder’s The Matchmaker, a comedy that owes its existence in part to the Festival’s first Artistic Director, Tyrone Guthrie, who in the early 1950s urged Wilder to rework its earlier incarnation, The Merchant of Yonkers. The story of marriage broker Dolly Gallagher Levi, who sets her own sights on one of her clients, the irascible businessman Horace Vandergelder, The Matchmaker was later adapted into the musical Hello, Dolly! (presented at the Festival in 2005). It will be directed by Chris Abraham, who directed a memorable production of For the Pleasure of Seeing Her Again for the 2010 season and is directing The Little Years, opening later this season. Meanwhile at the Avon Theatre, the incomparable Christopher Plummer takes to the stage to present his one-man show A Word or Two, a deeply personal work that focuses on his love of literature and the way it has shaped his life. Including selections from Stephen Leacock, Bernard Shaw and, of course, William Shakespeare, A Word or Two will be supervised and directed by Mr. McAnuff. Two musicals will be presented at the Avon Theatre: Gilbert and Sullivan’s comic operetta The Pirates of Penzance and the family favourite You’re a Good Man, Charlie Brown. You’re a Good Man, Charlie Brown, inspired by the world-renowned comic strip Peanuts, brings to the stage all Charles M. Schultz’s beloved characters – including Charlie’s beagle, Snoopy, and his nemesis, Lucy – in a musical guaranteed to delight the whole family. With book, music and lyrics by Clark M. Gesner, the show will be directed by Donna Feore, whose most recent Festival credit was her 2009 production of Cyrano de Bergerac. The season’s third Shakespeare play, Cymbeline, will be presented at the Tom Patterson Theatre, where it will be directed by Mr. Cimolino. It tells of the trials of Imogen, separated from her husband Posthumus through the villainy of the would-be seducer Iachimo. Like The Winter’s Tale and The Tempest, Cymbeline belongs to a group of plays Shakespeare wrote late in his career in which he explored themes of loss, reunion and reconciliation. Joining Cymbeline at the Tom Patterson Theatre is a classic from ancient Greece: Sophocles’ Elektra, in a translation by celebrated Canadian poet Anne Carson. A timeless tale of vengeful matricide and the price that must be paid for it, Elektra will be staged by Athenian director Thomas Moschopoulos, one of modern Greece’s most internationally acclaimed theatre artists. Four Canadian works, including three world premières developed through the Festival’s New Play program, will round out the 2012 season. Robert Service, who immortalized the Yukon in such beloved poems as “The Shooting of Dan McGrew” and “The Cremation of Sam Magee,” is the subject of the new musical Wanderlust, to be presented at the Tom Patterson Theatre. Written and directed by Morris Panych, with music by Marek Norman, this Festival commission celebrates both the allure of the frontier and the power of the imagination with a wit that matches the best of Service’s poetry. In The Hirsch Project (working title), developed through the Festival’s New Play program, Alon Nashman and Paul Thompson paint an intimate portrait of former Festival Artistic Director John Hirsch. Compiled from documents, letters and interviews, this play for a solo performer tells the story of Hirsch’s escape from the Holocaust, his arrival in Canada and his rise to national and international acclaim as a theatre director. Mr. Nashman will perform the piece, which will be directed by Mr. Thompson at the Studio Theatre. In another world première developed with the New Play Department, Daniel MacIvor’s The Best Brothers, two brothers re-examine their lives and relationships – with their partners and with each other – after the death of their beloved mother. This brilliant and biting comedy will be staged at the Studio Theatre under the direction of Dean Gabourie, the Festival’s Assistant Artistic Director, who directed 2009’s hilarious production of The Two Gentlemen of Verona. Also at the Studio will be MacHomer, an ingenious and wildly entertaining multi-media production in which Shakespeare’s Macbeth meets the animated TV show The Simpsons. Created and performed by Canadian Rick Miller, who adopts more than 50 different Simpsons character voices while retaining most of Shakespeare’s text, this one-man saga of blind ambition, fate and doughnuts has become an international hit, earning delighted acclaim from audiences of all ages. This entry was posted in 2012 Season and tagged 42nd Street, A Word or Two, Alon Nashman, Antoni Cimolino, Chris Abraham, Christopher Newton, Christopher Plummer, Cymbeline, Daniel MacIvor, Dean Gabourie, Des McAnuff, Donna Feore, Elektra, Ethan McSweeny, Gary Griffin, Henry V, MacHomer, Marek Norman, Morris Panych, Much Ado About Nothing, Paul Thompson, Rick Miller, Stratford Shakespeare Festival, The Best Brothers, The Hirsch Project, The Matchmaker, The Pirates of Panzance, Thomas Moschopoulos, Wanderlust, You're a Good Man Charlie Brown by Stratford Festival. Bookmark the permalink. Julia, so far the only casting that has been announced is Christopher Plummer and Rick Miller. Once we know other casting we will be sure to share that. The possibility of Colm Feore coming is still there. and in. It is important for a high heel shoe for you to become well fitted. As with the things would go into the bag, the bag would also have some additional weight. Either side flap marked 30, Stamped “Louis Vuitton Paris, Made doing France”. or would most likely be mounted to produce the boat. so everyone can buy. http://www.360-gamer.com/forum/member.